With more collections and a more spacious car parking, Kalyan Silks moves to Electra Street, Abu Dhabi. Dubai, UAE, October 11, 2018: For Kalyan Silks, the world's biggest silk saree showroom network, this is a year of many milestones. The most important among them is the completion of five glorious years in Abu Dhabi. As a part of the 5th year celebration, Kalyan Silks is all set to unveil a new showroom on Electra street which will showcase bigger collections, better facilities and provide the shoppers with a more spacious car parking. Mr. T. S. Pattabhiraman, Chairman & Managing Director, Kalyan Silks, inaugurated the showroom on October 11 at 11 am in the presence of Mr. Prakash Pattabhiraman, Executive Director, Kalyan Silks, Mr. Mahesh Pattabhiraman, Executive Director, Kalyan Silks, Mrs. Vardhini Prakash, Director, Kalyan Hypermarket, Mr. V.O.Sebastian, Chairman, ARECA, Mr. Ahmad Moosa Hassan, Mr. V.A.Hassan, Mr. Appuni Menon, Mr. Saleem Thangal and numerous other guests. Spanning over two spacious floors, the showroom will be a whole new experience for the discerning shoppers in Abu Dhabi. Besides presenting Abu Dhabi with a new showroom, Kalyan Silks will launch the biggest Diwali collection in the UAE and a fabulous Diwali offer. Through this offer, customers will get a free gift voucher worth AED 50 with every purchase worth AED 250. 'Kalyan Silks has completed 5 successful years in Abu Dhabi. 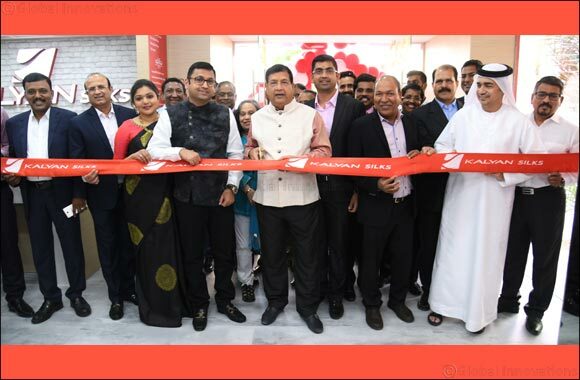 As a token of immense gratitude for the support extended to us, we are dedicating the new showroom with bigger collections and better facilities to the shoppers in Abu Dhabi, especially Indian expatriates.”, said Sri. T. S. Pattabhiraman, Chairman & Managing Director, Kalyan Silks. The new showroom has many surprises in store for shoppers. Limited editions in silk handpicked from Kalyan Silks' own looms will be one of the major attractions. The showroom will also showcase the latest in bridal silk, Kanchipuram, Banaras, Mysore silk sarees, fancy sarees, chiffon sarees, cotton sarees, set sarees, matching blouse materials, ready-to-stitch churidhar materials, ghaghra cholis, salwars, kurtis, lehengas, ladies' western wear, men's formals and casuals, men's western wear, dhothis and kids' wear. Today Kalyan Silks' international network consists of five showrooms. Besides the showroom at Electra Street, Kalyan Silks has two showrooms in Dubai, one in Sharjah and one in Muscat. Kalyan Silks' global showroom network comprises of 28 world-class showrooms spread across Kerala, Karnataka, Tamil Nadu, the UAE and Oman. The world leader in silk prides itself on unmatched infrastructure facilities such as over 1000 weaving centers, more than 100 production units and innumerable design salons. It's facilities like these that help Kalyan Silks bring millions of customers around the world the best in fashion at the most affordable prices. “To bring the biggest and latest Diwali collections to the Middle East market, our in-house designers have worked tirelessly for months. I am sure the specially designed collections for this festive season will set a new trend across the UAE. We sincerely hope that with bigger collections and a more spacious car parking, Abu Dhabi will find family shopping more enjoyable than ever before.” Sri. Pattabhiraman added. The new Kalyan Silks showroom is located on ‘Syed The First Street' (Electra street), Next to Honda showroom and Sharjah Islamic Bank (opposite to Royal Rose Hotel).